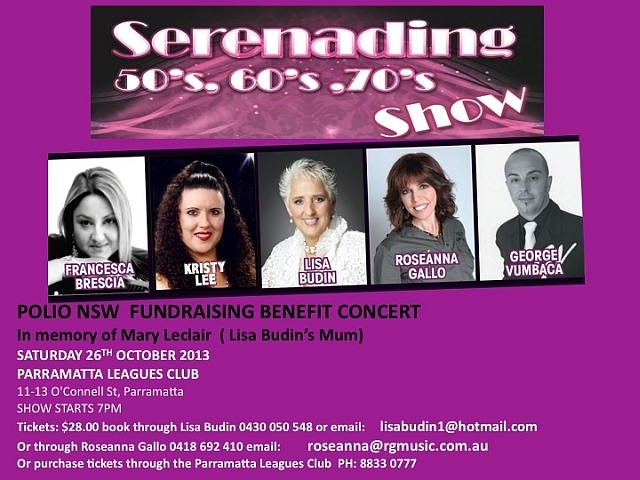 The Polio NSW Committee is very excited about this upcoming benefit concert and we would like to thank Lisa Budin for all her support in organising this fundraising charity event. The Serenading the 50’s, 60’s and 70’s Show benefit concert is in memory of Lisa’s mother Mary Le Clair, a long-standing member of Polio NSW. Lisa is a renowned singer and entertainer and has performed her Remembering the Carpenters show at many venues including the Sydney Opera House. Lisa also stages Senior Concerts at venues throughout Sydney. Click here to visit Lisa’s website. The fee for hiring the Auditorium at the Parramatta Leagues Club has been generously waived by the Directors of the Club; we are very appreciative of this gesture and for their continued support of Polio NSW. So, please make every effort to gather your family and friends together and attend this concert in support of Polio NSW.